Dr. John Krieger obtained his Doctorate of Veterinary Medicine from Michigan State University (2002). Dr. Krieger is a member the MVMA, SEMVMA and AVMA. He joined AEC in 2017. 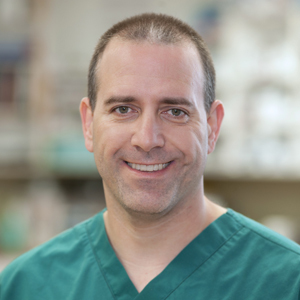 Dr. Krieger has been doing emergency veterinary medicine since he graduated in 2002. He has a strong interest in soft tissue cases and treating trauma cases. Dr. John is married with 1 child and 7 dogs (6 of them are French Bulldogs!). He enjoys golfing and triathlons and is working towards completing a full ironman (2.4-mile swim + 112-mile bicycle ride + a marathon 26.2-miles)!